Proven Performance for over 40 Years in Electrical & Utility Industries. Now with Integrated Grounding Option. 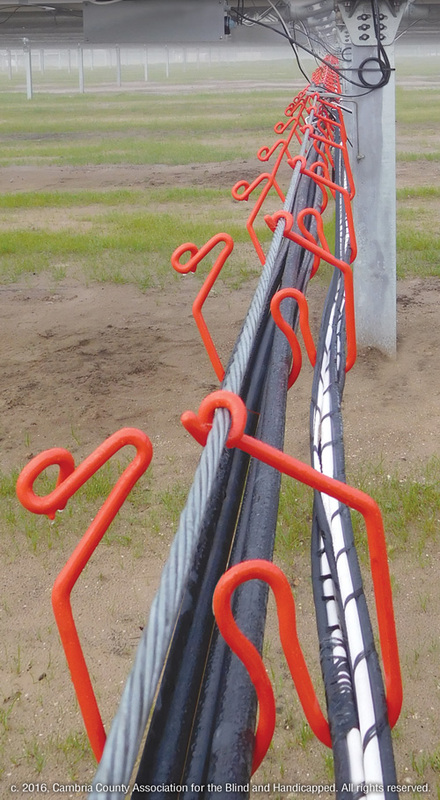 CAB Solar Cable Management delivers safe, strong and durable support for all types of wiring in utility scale, ground-mount solar power plants. 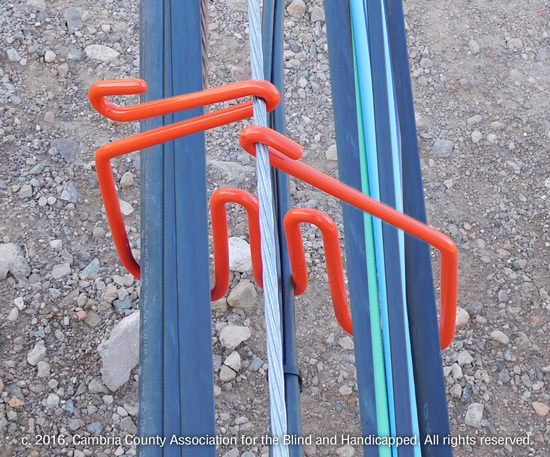 CAB’s patented cabling system has gained wide attention and acceptance because it is quick and easy to install and provides large labor and material savings on solar projects. CAB’s cabling system effectively performs as a high quality, mini cable tray system for a fraction of the cost of cable tray. CAB’s innovative multi-carrier hangers safely separate bundles of cables to meet NEC requirements. Over 50 standard designs are available to safely support large bundles of string wires and DC feeders, as well as various AC, data or other cabling. Custom configurations are also easily manufactured to meet specific project requirements. Standardizing Cable Management with CAB Solar helps to lower engineering costs in a developer’s portfolio of projects. In addition, it provides much more predictable costs of installation compared to trenching or cable tray. 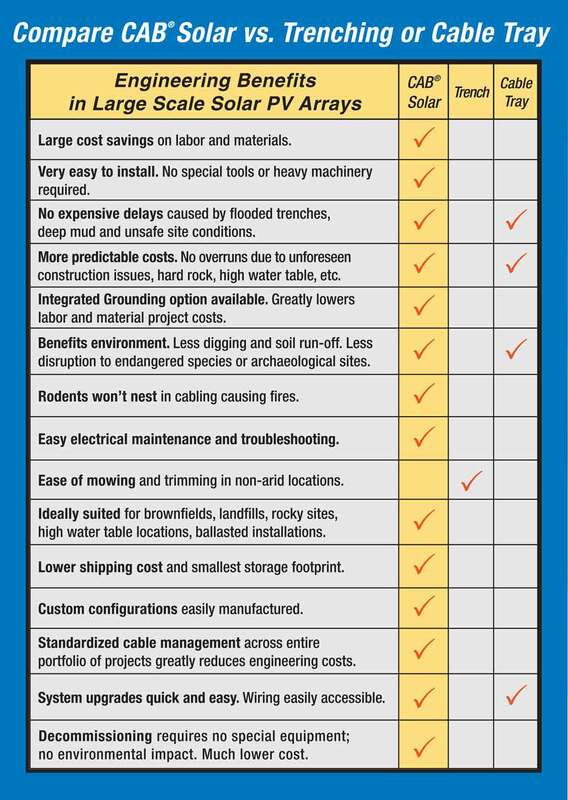 See complete list of CAB advantages in Comparison Chart below. CAB Integrated Grounding eliminates the need to run a separate grounding conductor and grounding jumpers to all mid piers. The patented design includes a custom engineered messenger wire, clamps and mid pier brackets. CAB’s system provides both the Equipment Grounding Conductor (EGC) and the Grounding Electrode Conductor (GEC). It meets NEC and IEEE standards, and is ETL Safety listed by Intertek to UL 2703. Click to open and print pdf file of brochure above. CAB Hangers are manufactured form Class 3 galvanized, high tensile strength spring steel for maximum strength and corrosion resistance. All hangers receive a thick PVC coating that provides added safety and protection for cables. The high performance coating is applied on 100% of the surface which makes hangers totally insulated and durable in highly corrosive environments. The coating also makes hangers easier to handle and install which reduces installation time. CAB’s 80 mil (2mm) thick PVC coatings are flame retardant, chemical resistant and UV stabilized for long service life. They are also high dielectric grade with a dielectric breakdown strength of 400 volts per mil (.025mm). CAB’s standard color is high-visibility safety orange. Dark gray is also available for archeological or other sensitive sites. CAB’s Solar Cable Management System is ETL Safety Listed to the following Safety Standards: UL 2239, UL 1565, CAN/CSA C22.2 No. 18.4-15, and C22.2 No. 18.5-13. CAB’s Integrated Grounding System meets NEC and IEEE Standards per 2017 HDR Electrical Report and is ETL Safety Listed to UL 2703. CAB’s Cabling System is installed by running a high strength messenger wire that is mounted to mid pier and end pier brackets in the solar array. Individual CAB hangers are then attached to the messenger wire at preset intervals. CAB’s innovative design provides a strong, tight grip of the hanger to the messenger wire to prevent slippage. Cables are easily loaded in the hanger and safely separated to meet the NEC. Over fifty standard CAB designs are offered to safely support large bundles of string wires, DC feeders, as well as AC, Data or other cabling. Custom configurations are easily manufactured to meet specific project requirements. CAB Hangers (pictured above) are open and ready to receive additional cables. Once loaded, hangers are easily closed and locked in place on the messenger wire. No special tools needed. Hangers may be opened again to add cables, perform maintenance or upgrade the system. 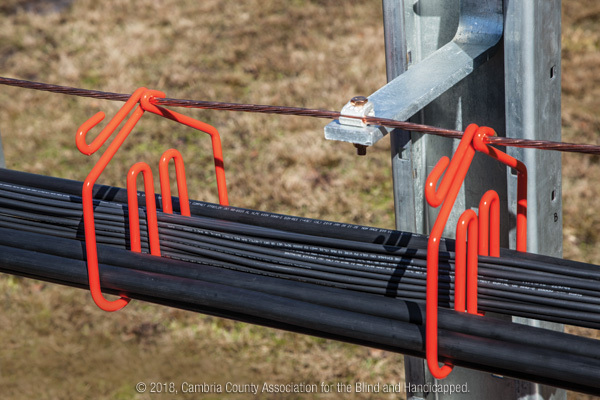 The National Electrical Contractors Association gave its prestigious 2018 Showstopper Award to CAB’s new, patented Solar Cable Management System with Integrated Grounding. The CAB system was selected by a panel of experts as a top new product of the year for its innovative design and for the many benefits it provides to electrical contractors. It was featured in the January 2019 edition of Electrical Contractor magazine. 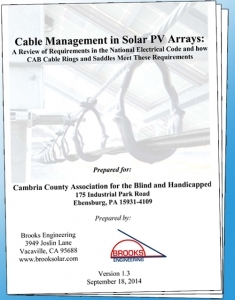 “Cable management is critical to the safety and longevity of nearly every Solar PV System. This is primarily due to the extensive use of exposed cables in the PV array. “Using purpose-built products like CAB Cable Rings and Saddles for exposed cable management in a PV array is well substantiated by NEC and industry installation standards. 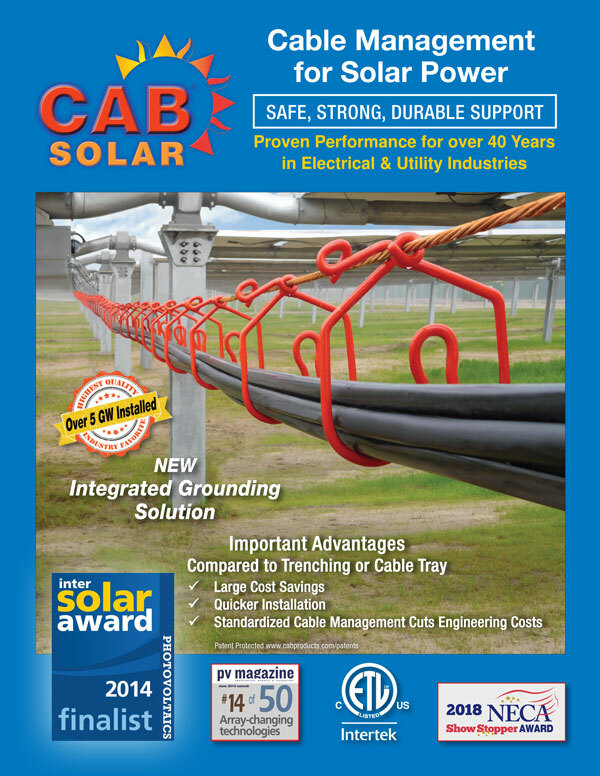 CAB Solar Cable Management offers many options. We recommend a specific Bill of Materials for each project. Our solar staff can assist you in selecting the proper size hangers, L-brackets and messenger wire. Tim Wedding is our Solar Project Manager. Please Click Here to request his assistance, or call 814-472-5077. CAB Cable Hangers are quick and easy to install. Cables are loaded into hangers, and then hangers are closed to lock in place on messenger wire. Cables can be pulled long distances through previously installed hangers. This makes it simple to add or remove cables in the future. CAB Solar Hangers are offered in a wide variety of styles and configurations. Contact us for more information.